Whether the dead of winter or the height of summer, it's important to me to incorporate SPF into my skincare all year long. I look for a moisturizer, foundation or tinted moisturizer to wear that contains sunscreen as I find that adding a regular sun cream underneath my regular skincare and make-up routine often results in runny make-up and cream in my eyes that irritates my contacts. I save regular sun cream for days when I'm actually out in the sun and not wearing any make-up at all, so basically holidays and weekends. 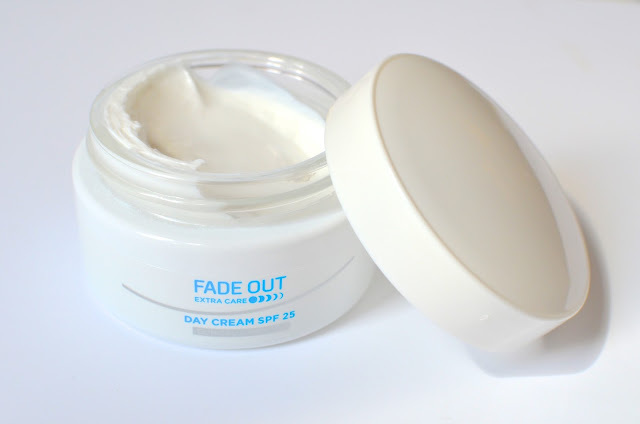 I've recently been using Fade Out Extra Care Day Cream SPF 25 and I am super in love with this product. It's rich and thick without feeling at all heavy, but makes my skin feel moisturized and smooth. With SPF 25 alongside UVA/UVB filters, I don't worry about going outside while I'm wearing it and it doesn't interfere with the rest of my skincare routine or make-up. The bonus of using this cream is that it evens skin tone by reducing areas of hyperpigmentation, promising results after just 4 weeks although I can attest to a reduction in redness on my face after just 2 weeks of use. Using this product makes applying make-up a cinch as I don't have to focus so hard on evening out my skin tone and it's even better preparation for days when I want to go make-up free with an even complexion. Fade Out Extra Care Day Cream SPF 25 is formulated with natural, active ingredients including Niacinamide which occurs naturally in Vitamin B3, natural extracts of Licorice, Mulberry extracts and naturally occurring Lactic Acid. The cream is suitable for everyday use and should be applied after cleansing, but I usually use mine after I've applied a toner, a light serum and eye cream, which seems to work just fine. There's only a light, clean scent that's not at all intrusive and won't interfere with the scents of other products you use on your face or your favorite fragrance. Fade Out Extra Care Day Cream SPF 25 is available online via Boots and is just £9.29 for 50ml, so it's a bargain. For more information on Extra Care Day Cream SPF 25 and other products in the range, visit www.fadeout.com.